Our tissue confetti cannons are loaded to the max with colourful confetti – perfect for parties, weddings, awards ceremonies and more! Choose from three different sizes (Small/Medium/Large) and fill with biodegradable, multicoloured tissue in your own unique blend of up to three different colours, including burgundy and lilac. Shower party-goers in glittering confetti to create a spectacle that will be remembered forever. Our air-powered, glitter confetti cannons are available in three different sizes. Create your own mix from a range of metallic confetti colours including sparking silver and glimmering gold. For those hosting an event or party outdoors, look no further than our mess-free BioFetti cannons. They fire biodegradable confetti 12 metres into the air – dissolving on its own within a couple of days, or instantly with a splash of water. Choose from three different sizes (Small/Medium/Large) and fill with your own unique blend of up to three different colours. Our custom filled 50/50 confetti cannons fire a combination of tissue and metallic confetti up to 12 metres in the air – dependent on which cannon size you select. Choose from seven metallic and fifteen tissue colours to truly customise your confetti shower. Safe and easy to use indoors or out, these cannons are filled with your own combination of metallic streamers, firing up to 25 metres depending on the cannon size you choose. Pick from seven classic colours and mix to create your own combination including patriotic red, silver and blue. 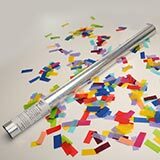 Our unique shaped confetti cannons are ideally suited to themed celebrations, events and parties. Personalise your cannon by choosing from a wide range of tissue and metallic confetti shapes including hearts, petals, butterflies and snowflakes.